A set of plastic bidding refills to replace the cards in four boxes for bidding. These 100% plastic replacement bidding cards are made of plastic so they can be wiped clean with a damp cloth, and won’t dog ear with repeated use. This set will replace all of the cards in four boxes that take standard size cards (Jannersten Neo, Bidding Buddy, Bridge Partner and the wooden bidding boxes). 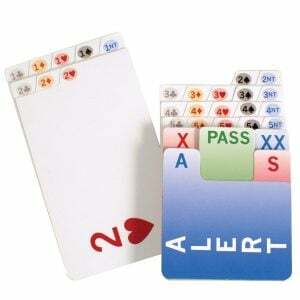 These cards are not suitable for the Pocket Bridge Partner boxes. Each card is 0.29mm thick, and each set (for 1 box) weighs 132g.